This is the 8th post in a series of monthly posts covering (forgotten/ignored) WikiLeaks cables about Lebanon. The Lebanese have been living among trash for the past two months. Instead of properly solving the garbage crisis, the Lebanese political class brilliantly concluded that the source of the crisis was – no, not the corruption – the lack of communication between Lebanese politicians. We don’t have water, electricity, presidential elections, parliamentary elections, or freedom of speech. Actually, we don’t have anything. And no, it’s not because our politicians don’t work and are too lazy to do their job. It’s because our politicians don’t communicate enough with one another. It’s not because they have failed time after time – even with popular pressure – to come up with an eco-friendly solution to the garbage crisis and have instead amazed us with government plans as trashy as the garbage piling up on the streets, thinking that the people will eventually accept the fait accompli and cheer for the government’s bad solutions when the first rains come and there is nothing else but their solution to save us from the worst to come. You see, the Hezbollah-Mustaqbal dialogue was not enough. The FPM-LF dialogue was not enough. The 2006 dialogue was not enough. The 2007 La Celle-Saint-Cloud dialogue was not enough. The 2008 Doha dialogue was not enough. The 2009 dialogue was not enough. The 2010 dialogue was not enough. The 2012 dialogue was not enough. The 2013 dialogue was not enough. The 2014 dialogue was not enough. The 2015 dialogue was postponed, so clearly it’s also not enough. 10 years of dialogue weren’t enough. The 2055 dialogue won’t be enough, the same way the 1975 dialogue wasn’t enough. They should talk more. Even more. Perhaps discuss the weather. The sandstorm. The snowstorm. All kind of storms. We pay them to talk, don’t we? 1975. Yes, you read that right. We had national dialogues in 1975, and as our politicians discussed, postponed and kept on discussing, the country was enjoying the looting, the massacres, the destruction and the various foreign occupations, the same way the country is today enjoying the smell of garbage, corruption and political repression. This month’s Wikileaks cable is inspired by the September 2015 dialogue sessions between the Lebanese Za’ims. It’s a Kissinger cable discussing the newly formed national dialogue committee in 1975 that was supposed to solve the crisis at the very beginning of the Lebanese civil war. As you read the cable, you’ll see how we have been basically stuck in the seventies for the past 40 years. This quote from the cable, “thus far, dialogue committee has succeeded only in applying soothing balm to national wounds requiring radical surgery” sums up 40 years of Lebanese national dialogues. 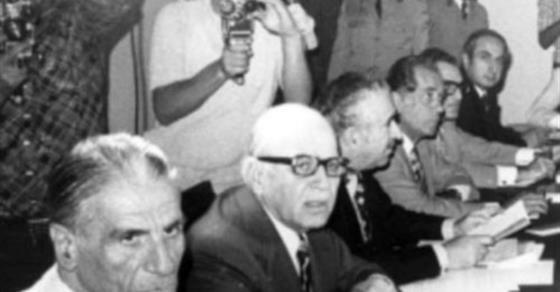 Note how our politicians always seem to put the word “national” in the dialogue’s name as an attempt to monopolize the crises, exclude everyone else, and give themselves legitimacy and the national dialogue’s decisions more power than the official laws or decrees (the Baabda declaration, among other decisions, is a perfect example) although the “national dialogue” body has no constitutional basis and its members aren’t even elected by the people. COMMITTEE OF NATIONAL DIALOGUE: LEBANON BITES THE BULLET WILL IT EASE THE PAIN? ONLY DISCERNIBLE WAY OUT OF THE CURRENT CRISIS. CONCEIVABLY IT WILL DAMPEN THE FIGHTING, BUT ITS LARGER AIM OF TACKLING BASIC SOCIAL AND POLITICAL ISSUES MAY PROVE TOO FORMIDABLE A TASK. EVEN THE IMMEDIATE GOAL OF STOPPING ROUND 4 COULD BE BEYOND ITS CAPABILITIES, SINCE ITS FIRST SESSION SEPT 25 POSTPONED DELIBERATIONS UNTIL MONDAY, SEP 29 AND THE FRAGILE CEASEFIRE MUST HOLD UNTIL THEN TO PRESERVE THE COMMITTEE’J CREDIBILITY. LEFTISTS ARE STRONGLY REPRESENTED IN THE “DIALOGUE”, BUT THEIR VOICE IS DIVIDED. THE ECLIPSE OF PRES FRANGIE IS INSTUTIONALIZED, SINCE NONE OF THE MEMBERS IS CLEARLY A FRANGIE MAN. IN GENERAL: SO FAR SO GOOD, BUT THE HARD ROAD LIES AHEAD. END SUMMARY. 1. LEBANON HAS WAGERED MUCH ON A SINGLE CAST OF THE DICE WITH THE FORMATION OF THE 20 MAN “COMMITTEE OF NATIONAL DIALOGUE” (REFTEL). AN EXAMINATION OF PREVIOUS ROUNDS THIS YEAR WILL SHOW THAT TEMPORARY OF A SIDE ISSUE WHICH HAD ASSUMED CENTRAL IMPORTANCE IN THE COURSE OF THE FIGHTING. ROUND ONE WAS BROUGHT TO VMA CLOSE BY GEMAYEL’S AGREEMENT TO TURN OVER FOR QUESTIONING SEVERAL INDIVIDUALS ACCUSED OF COMPLICITY IN SO-CALLED AIN RUMMANEH “MASSACRE” OF APRIL 14. ROUND TWO TAPERES OFF FOLLOWING THE RESIGNATION OF THE MILITARY CABINET WHICH ASSUMED POWER ONLY AFTER RPT AFTER THAT ROUND BEGAN; AND ROUND THREE ENDED WITH NAMING OF KARAME CABINET. FOLLOWING SUCCESSION OF ABORTIVE CEASEFIRE, LEBABESE, WITH ASSISTANCE OF SYRIANS, HAVE SETTLED UPON DIALOGUE COMMITTEE AS DEVICE FOR HOPEFULLY BRINGING RELIEF FROM STRIFE WHICH HAS BROUGH THIS COUNTRY AS NEAR TO NATIONAL COLLAPSE AS ANY DEVELOPMENT IN ITS TROUBLED HISTORY. 2. THE DIFFERENCE, THIS TIME, IS THAT THE SIDE ISSUE EMPLOYED (FORMATION OF THE COMMITTEE) IS DIRECTLY RELATED TO SENSITIVE ISSUES WHICH UNDERLIE THE BASIC CONFLICTS IN THIS SOCIETY. IF THE ENVISIONED DIALOGUE DOES NOT BEAR SUSTANTIVE FRUIT, THE COSMETIC EFFFECT OF ITS INSTITUTIONALIZATION WILL NOT PRESERVE FOR LONG THE FRAGIL LULL IN THE CLASHES THAAT HAVE BEEN TEARING AT LEABNON VITALS. SHOULD THE OPTION OF TALKING TO HEAL THE DEEP AND DIVISIVE FISSURES IN THE LEBANESE BODY POLITIC FAIL, LEBANON MAY FIND ITSELF WITH OUT EVEN THE HOPE OF “NATIOAL RECONCILATION” TO PREVENT ITS BEING SWEPT OVER THE EDGE INTO THE ABYSS OV CIVIL WAR. 3. NATURE OF THE COMMITTEE: THE” DIALOGUE COMMITTEE” WHICH ASSEMBLED AT 1100 HOURS(LOCAL ) THIS MORNING FOR ITS INAUGURAL SESSION IS, TO OUT KNOWLEDGE AT LEAST, THE MOST COMPREHENSIVE GROUPING BROUGH TOGETHER IN LEBANON SINCE INDEPENDANCE. WE FIND IT NOE WORTHY AS A STRAW IN THE WIND THAT COMMITTEE INCLUDES TEN CHRISTIANS AND TEN MOSLEMS (DIVIDED AMONG SUNNI, SHIITE AND DRUZE). A USEFUL PRECEDENT HAS THEREFORE BEEN SET AT THE OUTSET FOR A POSSIBLE 50-50 DIVISION BETWEEN MOSLEMS AND CHRISTIANS AS A STEP TOWARD MEETING MOSLEMS DEMANDS FOR GREATER POLITICAL POWER. CONFESSIONAL AFFILIATION, OF COURSE, DOES NOT TELL THE ENTIRE STORY. TO GIVE BUT TWO EXAMPLES, ONE OF THE TWO DRUZE, ARSLAN (JUMBLATT IS THE OTHER), CAN BE EXPECTED TO ACT IN CLOSE CONCERT WITH PRESENT INTMIN CHAMOUN. ABBAS KHALAF, ALTHOUGH A CHRISTIAN, WILL BE HAVE IN HIS CAPACITY AS A LEFTIST. CONAEQUENTLYUN IT IS NECESSARY TO LOOK ALSO TO THE POLITICAL COMPOSITION OF THE GROUP. JUMBLATT AND OTHER LEFTISTS. QARANOUH IS ALSO REPORTEDLY CLOSE TO SUNNI GRAND MUFTI KHALED HASSAN AND MAY TEND TO ORIENT HIMSELF TOWARD OTHER MORE MIDDLE-OF-THE ROAD SUN- NIS (KARAME, SALAAM, AND YAFI). NEVERTHELESS, LEFTIST ROLE IN COUNTRY’S POLITICAL XUTURE FINDS SUBSTANTIAL RECOGNI- TION IN COMMITTEE. 5. SUNNI/SHITTE EQUALITY: TO THE EXTENT THAT COMMITTEE MAKE- UP MAY PROVIDE A BELLWEATHER FOR THE FUTURE, WE ALSO FIND PARITY BETWEEN SUNNI AND SHIITE PARTICIPANTS SIGNIFICANT. LIKE SUNNIS, SHIITES HAVE FOUR REPRESENTATIVES (ASAAD, WAHID, AWADAH, AND KANSU). SHIITE CHOSEN, HOWEVER, REFLECT SERIOUS DIF- FERENCES WITHIN LEBANON’S LARGEST AND POOREST MINORITY. WAHID IS THE SOLE SPOKESMAN FOR THE IMAM MUSA SADR AND THERE ARE ALREADY RUMBLINGS OF THE IMAM’S DISSATISFACTION WITH THE SLIM RECOGNITION ACCORDED HIS ROLE IN LEBANON. ASAAD IS, OF COURSE, A BITTER POLITICAL RIVAL OF THE IMAM AND DID NOT ATTEND THE FIRST SESSION OF THE COMMITTEE, PLEADING THE PRESS OF PARLIAMENTARY BUSINESS. HE HAD EARLIER CALLED A SPECIAL SESSION OF PARLIAMENT TO CONSIDER THE COUNTRY’S PROBLEMS. AWADAH AND KANSU, AS NOTED ABOVE, ARE TO THE LEFT OF THE IMAM IDEOLOGICALLY, BUT, OF THE TWO, WE BELIEVE WAHID WOULD FIND KANSU MORE COOPERATIVE. SABRI HAMADE, FORMER SPEAKEC AND A SHIITE POWER IN THE BAALBEK REGION, IS RE- LIABLY REPORTED TO BE LIVID AT HIS EXLUSCION FROM PRO- CEEDINGS AND ADEL OSSEIRAN (CURRENTLY MINISTER) IS THE ONLY MEMBER OF CABINET NOT INCLUDED IN GROUP OF TWENTY. WE SUSPECT BECAUSE OF ILL HEALTH. FRANGIE TO JUMBLATT, IS DEFINITELY NOT ON THE FRANGIE TEAM. ON THE OTHER HAND, THE FULL MEMBERSHIP OF THE TRIPARTITITE ALLIANCE (KARAME, SALAAM, AND EDDE), WHICH WAS FOUNDED UPON THE BEDROCK OF OPPOSITION TO FRANGIE, MADE THE RE- CONCILIATION TEAM. 7. COMMITTEE’S FIRST SESSION: COMMITTEE HAS JUST COM- PLETED ITS FIRST FOUR-HOUR STVSION AND SET 1000 HOURS, MON, SEPT 29 FOR THE NEXT MEETING. IN ADDITION TO ASAAD, BOTH TAQLA AND RABBATH WERE ABSEND DUE TO LRAVEL ABORAD. KARAME SERVED AS CHAIRMAN THIS GO-ROUND, BUT WE UNDERSTAND THAT POSITION WILL ROTATE IN SUBSEQUENT SESSIONS. ACCORDING TO PRELIMINARY REPORTS OF MEETING, EXCLUSION OF MENTION OF PALESTINIAN PRESENCE IN COUNTRY WAS ONLY PRECONDITION OF SESSION. WE UNDERSTAND ALSO THAT ALL PARTICIPANTS SHOOK HANDS AND THAT ATMOSPHERE OF SESSION WAS AS CONCILIATORY AS COULD BE EXPECTED. STATEMENT ISSUED AT CLOSE OF TODAY’S MEETING COVERED THREE POINTS: (A) RESPECT FOR CEASEFIRE; (B) ADHERENCE TO LEBANESE FORMULA ON BASIS THAT LEBANON IS FOR ALL CITIZENS AND NOT ANY ONE GROUP, AND (C) AGREEMENT TO CONTINUE CONSULTATIONS TO REACH POLITICAL, ECONOMIC AND TZVTAL REFORM WITHIN DEMOCRATIC FRAMEWORK. STANDDOWN HOLDS FOR THE TIME BEING (WE WOULD RATE CHANCES AT NO MORE THAN 50 PERCENT), SUBSEQUENT COMMITTEE SES- SIONS WILL BE REPLETE WITH OPPORTUKITIES FOR A BREAKDOWN OF PROCESS AS CONCRETE ISSUES ARE TACKLED. 9. LEBANON IS RIPE FOR ON E OF ITS FABLED “MIRACLES,” BUT IT IS DIFFICULT FOR US TO PREDICT ONE IN THE MIDST OF THE HATREDS AND ANIMOSITIES WHICH HAVE BLOSSOMED INTO FULL FLOWER OVER THE LAST SIX MONTHS. THE OUTLOOK REMAINS GRIM. IF THE LEBANESE HAVE TAKEN THE BULLET IN THEIR TEETH AT LAST, ONE MUST CONSTANTLY BE AWARE THAT THEY ALSO RE- TAIN A ROUND IN THE CHAMBER. hahahahahahaha. We should blame Barbar for postponing those dialogue sessions!